Pampers Easy Ups are an easy way to underwear! 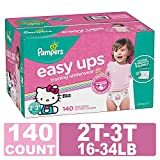 Pampers Easy Ups Training Underwear have a 360 Degree stretchy waistband that moves with your toddler, giving her a fit that's just like real underwear. The elastic waistband helps her to pull up her Easy Ups with ease, like a big girl. They also tear easily at the side seams for easy removal, just in case! Easy Ups are super soft, like cotton underwear, to keep her comfortable, while the Dual Leak Guard Barriers will keep her confident-helping prevent the leaks that can happen when she moves. Plus, Pampers Easy Ups are the only training pants with Extra Absorb Channels to give her the outstanding Pampers Leak Protection she needs during the day AND night. A collection of Hello Kitty designs will help make potty training fun! Pampers Easy Ups: she'll think it's underwear. You'll know it's Pampers.